Are women returners the possible solution to the tech sector skills shortage in Ireland? The ICT sector will need over 70,000 new workers over the next five years with new graduates likely to make up about half of these numbers. Developing new sources of talent will be critical to our Irish tech sector. One solution could be to tap into an existing talent pool by supporting tech women to returning to work after a career break. Only 17% of ICT professionals are female and a further attrition of around 40% in mid-career means that the sector is losing valuable female talent. 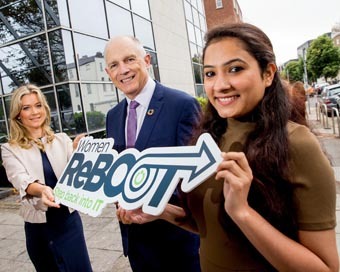 The Women ReBOOT programme is an innovative initiative from the Technology Ireland Software Skillnet. Funded by Skillnet Ireland, it supports women with technology sector skills and experience to return to work after a career break, by updating technology and professional skills, building confidence and facilitating paid work placements with leading technology firms. Paul Healy, Chief Executive of Skillnet Ireland said: “Skillnet Ireland recognises the importance of attracting more women and girls into STEM related careers. We are working with employers to identify and develop female tech talent, and we are pleased to support a number of related initiatives with the Technology Ireland Software Skillnet”. There are plans to expand the ReBOOT programmes to support the progression of women already in the sector towards leadership roles, to conduct research on women in technology in Ireland, and to create a new Women Technology Leaders forum bringing together top tech employers in a new think-tank. Funding from Skillnet Ireland will enable a further 100 female technology professionals to re-join the sector and take part in professional development within the sector this year. To find out more about the Women ReBOOT programme, visit their website here. Pictured: Minister of State for Equality, Immigration and Integration, David Stanton T.D., pictured with Alison Tighe, Resource Specialist, Datalex and Neha Katoch, Software Engineering Test, MasterCard at the Women ReBOOT Dublin Graduation event held recently at Ibec HQ.